I always remember when I was little I loved going to stay with my Aunt as she had ‘posh’ shampoo that smelt like sweeties. So when I got a bit older and my love of cosmetics and products began to bloom I realised that this ‘posh’ shampoo was actually very affordable and very easy to get my hands on. 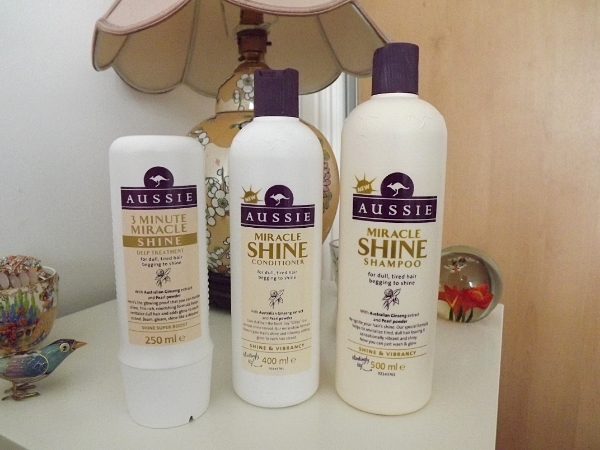 The Aussie haircare range has since remained one of my firm favourites, and when the new Miracle Shine Range was launched I was very intrigued to give it a go. The range is describe as ‘sunshine in a bottle’ something I am definitely seeking giving our recent weather here in Scotland has been far from sunny. Aussie Miracle Shine Shampoo*: When it comes to shampoo, I love a thick creamy texture, as I have really long dry hair so I prefer a richer formula, and like its other Aussie chums this has the smoothest creamiest texture ever, lathers up a dream and rinses out well. Ginseng and Pearl Powder combine in this to create a full, quenched super shiny head of hair! Aussie Miracle Shine Conditioner*: I LOVE conditioner, I know my thinner haired friends fear it, but I literally cannot get enough of the stuff. I use a generous blob of this and work it though the mid lengths to the ends of my hair, I tend to keep conditioner away from my roots as I feel it can leave my hair looking quite flat. This does exactly what it says on the bottle, makes my usually dull hair very shiny and very healthy looking (even if my split ends are hanging on by a thread). Aussie 3 Minute Miracle Mask*: I’ve been using this once a week on my hair and it is the perfect addition to my pampering session. The smell of this will leave you pondering whether it is actually edible (its not) and the formula really kicks my hair into shape giving me a weeks worth of super shiny super nourished hair. If your looking for an affordable hair mask then this is your guy, I’ve tried quite a few ‘higher end’ hair masks and this is just as good (if not better) than them. I’d recommend anything from this brand, but I especially love this formula as it’s been such a long winter and it’s nice to get a bit of shine back into my hair just in time for (fingers crossed) spring. This range is available to buy in Boots, Superdrug and most larger supermarkets, so be sure to go give it a little try and let me know what you think!